Every casualty of a car crash should consult with and obtain help from an experienced Los Angeles car accident attorney as soon as possible. Only the services of a physician might be of more immediate importance to the victim than those of an attorney. Injured victims of driver negligence have an enforceable right under law to full and fair compensation for the costs and losses they suffer. Whether they receive what the law provides for them or whether they receive any compensation at all depends on how well their attorneys can pursue their claims through the intricacies of the state civil legal processes. The drivers whose negligence causes their injuries generally will do anything possible, fair or not, to evade liability entirely and, if their evasive maneuvers fail to deliver them from accountability, to minimize the damages they must pay to restore to injured claimants to the extent legal remedies can make possible their lives as they were before their unnecessary misfortunes. The Pacific Attorney Group assists and represents clients injured in all kinds of traffic mishaps of all degrees of damage and distress. In all cases, the law firm’s sole concern is complete client recovery from their ordeals. Victims often assure themselves in hopeful denial that their injuries are neither serious nor cause for much concern, that they should resolve and heal quickly with little or no medical attention. But some injuries take more time than the injured might expect before their full effects become evident, it is always better to be safe than sorry, and if there is any pain or discomfort at all after a crash, a medical examination and a legal consultation are urgent needs. Pacific’s Los Angeles car accident attorney investigate, research, and review every case thoroughly and explain to clients their rights and answer all their questions fully. Pacific personal injury attorneys have handled rear-end, T-bone, bus, truck, motorcycle, and bicycle collision cases, vehicular accidents of all kinds, successfully represented pedestrian and cyclist claimants in various situations, and proven themselves repeatedly in complex cases of drivers allegedly under the influence of intoxicants and drivers more attentive to their cell phone conversations than to road conditions. Our attorneys understand that things happen quickly and suddenly on the road and that the best, most careful, and most responsible drivers can confront extraordinary and unforeseeable circumstances in which it becomes impossible for them to retain control. Many Los Angeles car accident attorney have defended drivers as former counsel for insurers for whom they developed and presented imaginative, ingenious, plausible, and persuasive theories of inevitability to support successful arguments for exoneration. Thoroughly familiar with the fundamentals of personal injury defense practice, they regularly train their less experienced colleagues in its most effective techniques so Pacific can continue to maintain its depth of talent in highway traffic personal injury legal practice expertise. Some car crash victims injured through no negligence or fault of their own receive phone calls from insurance claim adjusters or attorneys soon after their accidents asking whether they might be willing to settle all legal claims for a prompt, generous payoff. Insurers know they can induce some potential claimants to waive their rights to sue for recovery if they contact them before they talk to attorneys and become fully aware of what their claims are worth to them and how much a complete recovery from their injuries may cost. The lure of a quick cash settlement can be quite tempting. The agents for the insurers may discourage them from speaking to a Los Angeles car accident attorney by reminding them of the high cost of legal services and of the money they can save by doing it themselves without paying attorney’s fees. This idea is a bad one. Only rarely if ever does a do-it-yourself personal injury claimant negotiating with an opposing insurance claims adjuster or attorney do as well as a claimant assisted and represented by a skilled and experienced personal injury plaintiff’s attorney. The timeless truth is that in legal matters there is no substitute for the advice and advocacy of professional counsel. Should every personal injury claimant retain a Los Angeles car accident attorney? The answer to this question is yes in all cases, no exceptions. In settlement negotiations with unrepresented claimants on their own, the insurer’s agent has every advantage. First, they do it every day while most if not all claimants representing themselves are in the process for the first time. Then there is the claimant’s emotional state, in turmoil from stress and hardly conducive to either steadfast focus or logical analysis. Finally, the agents are practiced in the arts of deception and delay and not unwilling to employ these stratagems to trick claimants into accepting painfully insufficient settlement offers or losing their cases entirely and forever if delayed beyond the deadlines of statute of limitations in force in all states. Our auto accident attorney in Los Angeles are aware of all the tricks of the insurance agent’s trade. When Pacific is on the case, settlement negotiations proceed with no unnecessary delay to fair, final offers in most cases. In exceptional cases where the insurers insist on unfair settlement offers or none at all because they believe they might prevail in trials, they find out to their disappointment and dismay that Pacific trial attorneys have the knowledge, skills, and abilities to persuade trial jurors to award damages that sometimes turn out to be much more than the plaintiff settlement proposals the insurers had rejected. Pacific attorneys never argue with clients about whether they should accept settlement offers. They may advise and recommend an acceptance if a client’s case falters, for example, from loss of evidence, but they believe that, just as in criminal cases the decision to plead guilty to a charge is for the defendant alone to make voluntarily without pressure, persuasion, or undue influence from any source, the decision to accept a settlement offer must be voluntary and solely for the personal injury plaintiff to make. A Los Angeles car accident attorney from a high-grade firm like Pacific is an absolute necessity for every personal injury plaintiff. Amazingly, the attorney’s invaluable service is available at an incomparable bargain. Most of the best personal injury attorneys offer no-cost initial consultations to gauge the factual merit and potential value of claimant cases. Then they pursue the best results for their clients on contingency terms. Contingent fees to Los Angeles car accident attorney are not payable until they succeed in negotiating settlements or winning awards of damages for their clients. From the settlement proceeds or from the amounts awarded by verdicts, attorneys pay off the costs of the litigation, deduct attorney’s fees of typically a fourth to a third of the total recovery, and remit the remainder, usually at least a half of the total, to the clients, who pay no money into the case. What if the case turns out to be loser, the court finds for the defendant insurer, and the plaintiff receives nothing? In that case the personal injury plaintiff also pays no money. What better no-risk, no-money-down investment could clients have? What is my claim worth? What types of expenses may I be able to recover compensation for? Will my insurance policy cover this? These are all common questions that a person involved in a car accident may have, and a lawyer at Pacific Attorney Group may be able to answer these and many others. Arranging a free case review with a Los Angeles car accident attorney at our firm is one of the first steps you should take after a collision – it may serve to protect your right to maximum compensation. Compensation paid for medical treatment may include any and all medical care that a victim has received in relation to the car accident. Hospitalization, doctor visits, physical therapy, medication, medical supplies and even mileage expenses to get to and from medical appointments may be covered. Future medical care may also be covered, if the victim will require ongoing treatment. Money paid for lost income in a car accident claim may include any work that a victim has missed as a result of his or her injuries. It may also include loss of potential earnings, if a victim is unable to return to work in the same field or cannot return to work at all. Compensation for lost earnings can make all the difference as a car accident victim attempts to make ends meet even while unable to work. This may include any and all damage to a vehicle and any personal property that was caused in the accident. Compensation for property damage can help a victim get his or her car repaired, may pay for an entirely new vehicle if the car was totaled, and can cover other damage to real property, clothing and more. Pain and suffering refers to compensation that usually falls under the category of non-economic damages, as these injuries cannot be easily quantified. Emotional and psychological trauma, physical pain and other suffering experienced by the victim may be compensable, depending on the case. These damages can be more difficult to obtain, but with the right approach it may be possible to recover fair compensation for non-economic injuries and losses. Loss of consortium is another type of compensation that falls under non-economic damages. In some cases, a victim of a car accident may experience injuries that impact his or her relationship with a spouse, such as an inability to perform sexually. Seeking maximum compensation is of the utmost importance if a victim of an auto accident is to have the best chance of rebuilding and moving on with his or her life. This is the entire purpose of compensation, in fact, to help a victim rebuild to as similar a position as he or she was in before the accident occurred. We cannot erase the past or make it so our injuries never occurred, but we can move forward and work toward a brighter future in spite of any past trauma. Contact a Los Angeles vehicle accident lawyer at our firm today to find out more about our firm and the steps we can take to help you secure a fair settlement or award. Every year, millions of people are injured in auto accidents. In 2011 alone, more than 2.2 million people were injured in traffic accidents across the United States, according to the National Highway Traffic Safety Administration. These injury accidents accounted for about 40% of the more than 5.3 million collisions that were reported to the police that year. Looking at these numbers, this could mean that a person has about a four in ten chance of being injured in a car accident. The type and severity of injuries will vary depending on the type of collision, force of impact, the crashworthiness of the vehicle and whether the victim was wearing a seat belt. If you were involved in a car accident, truck accident, motorcycle accident or any other type of motor vehicle collision and were seriously injured, Los Angeles auto accident attorneys at Pacific Attorney Group may be able to help. Our legal professionals offer experienced and aggressive representation for clients throughout the greater LA area who have been injured as the result of another’s negligence. You can continue reading to learn more about the common types of auto accident injuries or are welcome to call our office at any time for a free, confidential case evaluation. Will my injuries be severe? The severity of injuries will vary widely depending on the unique circumstances surrounding the accident, so it is impossible to say how seriously a person may be injured in any one collision. Looking at auto accident statistics, however, can give us a better idea of how common it is for a victim to experience catastrophic injuries. According to statistics presented by the California Highway Patrol (CHP), there were a total of 71,866 people injured in auto accidents in Los Angeles County in 2010. 2,345 of these people suffered from severe wounds, and 17,274 experienced other visible injuries. The remaining 52,247 complained of pain. The tricky thing about auto accidents is that a victim may show no visible injuries but may actually have suffered soft tissue damage, such as whiplash, or may have even experienced bruised ribs, internal organ damage or other injuries that are not immediately visible at the scene. It is therefore of the utmost importance that you seek medical attention if you were involved in a car accident. Even if you are only experiencing minor aches and pains, it is important to have a medical professional look you over to ensure nothing is wrong. Inform your doctor that you have been involved in a traffic accident so he or she knows what injuries to look for, and be sure to keep all records related to your visit. If you were injured in a motor vehicle accident involving a sport utility vehicle (SUV) or van, you may have the right to take legal action. An accident lawyer at Pacific Attorney Group may be able to help. An accident may leave you and other parties seriously injured, and it may even lead to the wrongful death of one or more victims. In these situations, a victim can file a lawsuit against the party responsible for causing the accident in the first place. This may be a drunk driver or a driver who was speeding, texting or talking on the phone. In some cases, it may be the manufacturer of an auto part or even the local government for poor road maintenance. By investigating your unique case, we can assist you in holding the proper person or company responsible. Your initial case evaluation with our law offices is free. We can look over the circumstances of your SUV or van accident and determine who can be held responsible, as well as what your claim may be worth. Seat belts, when used, reduce the risk of fatal injury to front-seat passenger car occupants by 45 percent and light truck occupants by 60 percent. A seat belt works by holding a vehicle occupant in place to prevent the force of impact from throwing him or her into the steering wheel, dashboard, windshield, door or side window. It also prevents an occupant from being ejected from a vehicle during a rollover or other catastrophic collision. While some people may sustain injuries caused by the seat belt itself as it holds the occupant in place during a collision, the benefits generally outweigh this risk. Wearing a seat belt is required by law, and it may also help you avoid fatal injuries in the event of a collision. Injured? Talk to Los Angeles Car Accident Injury Attorney about your options. If you have been seriously injured in a car accident, or if you were struck by a motorist as a pedestrian, motorcyclist or bicycle rider, a lawyer at our firm can offer insight regarding your rights and options. You may be facing a long road to recovery – both physically and emotionally – and our team can work to help you recover the financial compensation that can help you in this. With more than 35 years of experience, we are prepared to offer you the highest quality legal representation in your case. Call our Los Angeles law offices today to see how we can help you. Car crash victims need competent legal advice, and they need it fast. Pacific Attorney Group offers wisdom acquired over 35 years of collective legal experience. Pacific attorneys have seen it all and are ready to put their formidable legal knowledge, skills, and abilities to work for personal injury claimants in need. Pacific enjoys membership in the Million Dollar Advocates Forum, a prestigious organization of fewer than 1 percent of all American attorneys Pacific between 2008 and 2010 recovered over $5 million per year in settlements and verdicts for its clients, testimony to hard work, superior skill, and dedication to client well-being. To discuss a claim, contact a member of the firm for a free initial consultation to get started. During this session, the attorney will determine what the claimant has suffered and lost and what needs doing to present the most compelling case for full and fair recovery. So do not delay. Time is of the essence in personal injury case preparations. Take action before important evidence disappears or becomes unavailable. Call toll-free 800-358-9617 or contact the firm by e-mail at [email protected] to schedule a free consultation. In Los Angeles, car accidents happen every day. The congested streets and freeways are ideal places for these types of accidents to occur. Unfortunately, spinal cord injuries are common results of car accidents. Direct trauma in a high-speed or high-impact collision may cause injury to the spine or spinal cord, such as a broken back or spinal fracture. The sudden force of a car crash may also cause spinal cord injury if the back is twisted or stretched suddenly or in an awkward position. Spinal injury is particularly prevalent in rollover accidents if the roof collapses during the accident. Even when properly wearing a seatbelt, a driver or passenger may be at risk of sustaining spine injury in a car accident. Call a Los Angeles spinal cord injury lawyer at our law firm today if you or someone you love was injured in a car accident. We are highly experience with spinal cord injury claims and can assist you by talking to you about your concerns and evaluating the particular accident you or your family member was involved in, in order to help you take the legal action that is your right. Car Accidents – Who is Liable for your Spinal Cord Injury Claim? The most common causes of car accidents are driver distraction, speeding and drunk driving. If another driver acted negligently in any way and caused your car accident, thus causing spinal injury, you may be able to bring a claim or lawsuit against that driver in order to recover financial damages for your injuries. This may cover medical care as well as any lost wages from missed work, damage to your vehicle and possibly more. With spinal cord injury claims, this is particularly important due to the costs of rehabilitation, continued therapy, and living with an injury of this magnitude. Car accidents are constant occurrences on Los Angeles streets and freeways. When these accidents are catastrophic in nature, they may cause serious injuries or even death to one or more of the people involved. Pedestrians, bicyclists and motorcyclists are at particular risk of serious injury in a car accident. The speed, force and location of impact in a car accident will typically determine what extent of injury that a victim may sustain, although a combination of these and other factors may also make it seem as though luck is involved. At Pacific Attorney Group, we handle all types of serious car accident claims throughout the Los Angeles area, including freeway accidents and high-speed or high-impact crashes that result in serious injuries or wrongful death. If you or a loved one was involved in a bad accident, a Los Angeles car accident injury attorney at our offices can offer you a free initial consultation to talk about your legal options and filing a personal injury claim. There are a variety of different serious injuries that may result from a car accident. A victim may be at risk of internal bleeding, head trauma, brain injury, amputation, spinal cord injury, multiple bone fractures, organ damage, and more. Any one or more of these injuries may impact a victim for life, leading to extensive hospitalization, surgery, a temporary or permanent disability, scarring or disfigurement, paralysis, and an unknown future. Let an experienced car accident injury lawyer at our firm help you in taking legal action against the driver who caused your catastrophic injuries. With our help in recovering financial compensation, you may be able to get the money you need to begin rebuilding your life and moving on. Contact an injury attorney at our offices for your free case evaluation. If you were driving or were the passenger of a car involved in an accident with a large truck, you may have sustained serious injury and may have grounds for a claim against the truck driver or trucking company if their negligence was to blame. At Pacific Attorney Group, we represent truck versus car accident victims throughout Los Angeles and the surrounding areas in Southern California. We will be happy to offer you a free consultation to discuss your case and your legal options. When you talk to a truck accident lawyer at our firm, you may be surprised to find that you have the opportunity to recover significant compensation for your physical injuries as well as damage to your vehicle and emotional trauma. Truck versus car accidents are particularly serious due to two main factors: the size and weight of the large truck versus a typical passenger car and the height of the truck and where it may collide with a car. The larger mass of a semi truck or big rig places the smaller vehicle, the car, at immediate risk of sustaining catastrophic damage in a collision, according to laws of physics. This issue combined with the fact that the bumper of a large truck may collide with the top of a passenger car greatly increases the likelihood of serious injury to the occupants of the car as opposed to the driver of the truck. For your free truck accident case evaluation, contact an attorney at our offices. We accept calls 24 hours a day, 7 days a week and will be happy to discuss your claim and legal options with you. Any auto accident may cause catastrophic or fatal injuries. If you have lost a loved one in a fatal auto accident in the Los Angeles area, an attorney at our law firm may be able to help you. With our law firm’s assistance, you may be able to file a wrongful death claim against the driver or other party that caused the accident to occur. In this way, you can seek justice and have the opportunity of recovering monetary damages for your loss. 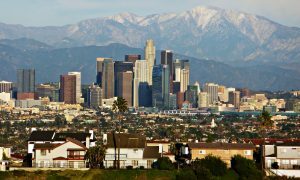 Car accidents are a common occurrence in the LA area, particularly due to the large number of vehicles on city streets and freeways at any given time. Almost any collision may be fatal, even if it occurs at a relatively low speed and if drivers and passengers are wearing safety belts. Pedestrian, cyclist and motorcycle accidents are more likely to involve serious injuries or fatalities, as are truck accidents. Regardless of the type of auto accident in which your loved one was involved, you will benefit from discussing your legal rights and options with a skilled professional. You will have a limited time to file a claim, and as such it is crucial that you act quickly. In addition to helping with any insurance claim, a lawyer can help you in filing a lawsuit against the person who was speeding, driving drunk or otherwise acting negligently or wrongfully and caused your accident. Holding the responsible party accountable for their actions in causing a fatal auto accident can help to bring surviving family members a much-needed peace of mind and can also help with difficult financial situations brought about by unexpected funeral costs, medical bills, and the lost income that a loved one used to provide. Car accidents are not simple affairs, especially when one or both drivers involved in one get rear-ended. In Los Angeles (L.A.), cameras have been installed in a lot of the traffic lights so as to hold offenders responsible for the traffic laws that they break. These cameras have failed, first of all, to prevent rear-end accidents in L.A. They have also failed to lessen them. The heavy, infamous bumper-to-bumper traffic that permeates the Los Angeles streets and highways is the single most affecting factor in the number of rear-end collisions that happen each day in the city. People follow each other too closely or drive too fast in dense streets, resulting in rear-ending. If you have been rear-ended in the city of Los Angeles, then read on. We have information that may pertain to you and help you legally. Getting rear-ended in your vehicle is shocking and opens up the adrenaline glands—it is hard, in a situation like that, to remember what you need to do to protect yourself and others, legally and physically. To begin with, never leave the scene of an accident. If you leave or flee, as it is legally referred to, the site where the accident took place then you could face criminal charges, fees, and possible jail time. Don’t admit your fault in the accident. This could be used against you in a civil court of law later on if either you or the other party involved in the accident decide to file a rear end collision claim with the help of a Los Angeles rear end collision attorney. Always go to the hospital immediately following a rear end collision. Some of the most severe consequences that result from a rear end accident are internally-based only and can only, therefore, be identified and treated by a licensed physician via a scan. Protecting yourself legally is, after protecting yourself medically, the most important step to take after you get into a rear-end accident. It’s a mistake to entrust your insurance company with your rear end case—insurance companies are interested in making money off of you, not helping you to get money back that you have lost after being a victim. That is where we come in. Our legal team is comprised of experts in the rear-end collision field, and will not charge you a thing until they win your case and earn their money. If you have been in a Los Angeles rear-end collision, and you have suffered injury as a result, then call our Los Angeles rear-end collision attorneys today for a free legal advising session. If you live in the Los Angeles area and have recently suffered an automobile accident, then read on. We have information that will help you in taking the next steps necessary to gain legal help and consequent financial retribution for your losses and suffering. Most people who have never been in an automobile accident think that their insurance companies will handle everything, and get them back the money that they lost. This is a false notion. Only a personal injury attorney will fight for your rights as a collision victim. Many people go off of appearances alone when it comes to accidents—if it doesn’t look serious, then many do not treat it as such. However, that is the wrong attitude to adopt when it comes to accidents. Each accident is serious, medically and legally, and you should treat it as such by protecting your health and your rights as a victim. One way to do this is by making sure that you go to the hospital right after getting into an automobile accident. Many of the most serious injuries are internal and can’t be seen on the externality of the body. Our Los Angeles Automobile Accident attorneys will never charge you for the time they spend passionately fighting on your behalf. Not only do we only collect our money after we have won you yours back, but we take financial responsibility for the court expenses and filing dues that add up and would otherwise further stress you out in your time of fragility and need. We will protect your rights as a victim of an automobile accident, Our legal team can offer you top-of-the-line services, starting with no-cost legal advice—whether or not you decide to hire us for your case. Contact one of our Los Angeles automobile accident attorneys if you have been in an accident in any part of L.A. or L.A. County. We will win you back the monetary compensation you are entitled to if we are able to deem you eligible for legal representation by one of our Los Angeles automobile accident attorneys in a civil court of law. There are many different scenarios that may lead to a car accident. A single collision may have a number of causes, and identifying these can be a difficult task. Determining cause, however, is an important part of seeking financial compensation for medical care and other expenses or losses associated with the serious injuries that may be caused in an accident. At Pacific Attorney Group, our goal as Los Angeles auto accident attorneys is to determine what caused our clients’ collisions so we can seek maximum compensation from any and all possible sources. Rebuilding and moving on in the wake of a serious car, truck or motorcycle accident can seem impossible. With our legal team to seek financial compensation to cover medical bills, ongoing treatment, lost earnings, property damage and all other losses or injuries, you have the best chance of getting your life back to where it was before the accident occurred. In our experience as personal injury lawyers, we have found that is really all most car accident victims want: for things to return to normal. Did you know that nearly one in three traffic accident fatalities in the U.S. involves a driver who had a blood alcohol concentration of .08% or greater? This is above the legal limit to operate a motor vehicle in the U.S. In California, 1,768 people were killed and another 24,343 were injured in drunk driving accidents in 2010 alone. Our attorneys believe in holding drunk drivers accountable for their recklessness and wrongdoing. According to the National Highway Traffic Safety Administration (NHTSA), speeding was considered a “contributing factor” in 30% of all fatal traffic accidents in the U.S. in 2011. The annual economic cost of these collisions is estimated to total $40.4 billion. Speeding increases the severity of an accident and leaves a driver with less control in an emergency situation. If you were injured by a driver who was speeding, a lawyer at our firm may be able to help you seek justice. Distracted driving is an issue that has gained a considerable amount of attention in recent years, particularly with the dramatic increase in cell phone and smart phone usage by drivers of all ages. Driving safely requires manual, visual and cognitive attention, and a distraction may be anything that takes one or more of these types of attention off the road and the task at hand: eating, drinking, talking on the phone, texting, smoking, talking to a passenger, etc. Reading and writing text messages or emails while driving is one of the most dangerous types of distracted driving. In California, it is illegal to text while driving because of the extreme hazard it poses. Texting and taking one’s eyes off the road for even a few seconds, at 55 miles per hour, would be like driving the entire length of a football field blind. On the road, this can be deadly. Most car accidents can be attributed to some form of driver negligence, but there are some cases where a defective auto part can cause a collision. Faulty brakes, for example, may cause a driver to run a red light even if he or she was paying attention and obeying traffic laws. An airbag that deploys unnecessarily can cause a collision as it strikes the driver. When defective auto parts cause collisions, our attorneys are prepared to hold manufacturers accountable. Heavy weather and dangerous roads can also cause serious traffic accidents, even when vehicles are working properly and drivers are acting responsibly. Heavy fog, snow, rain and ice can create conditions that make it difficult to drive, and improperly designed or maintained roadways can cause even the safest driver to lose control. Our team knows how to hold municipalities accountable for defective or dangerous roadways. Although Los Angeles is not necessarily known for its heavy weather, there are still weather conditions that can affect visibility and road conditions and therefore contribute to an auto accident. Take a November 2012 ABC News story about a single 8-hour time period during the rainy season that caused 188 accidents in Los Angeles County, according to the California Highway Patrol (CHP). Rain, fog and strong winds can all impact road conditions for Southern California drivers, who may respond improperly because they are not used to having to modify driving habits for heavy weather. 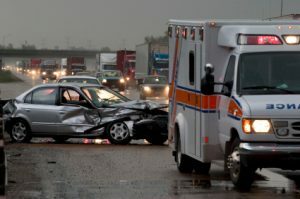 Even in a weather-related accident, where liability may be obscured just like the roads, a Los Angeles auto accident attorney at Pacific Attorney Group may have much to offer in terms of insight and legal counsel. Our firm represents clients throughout the greater LA area who have been injured in any type of car accident, including those that may be attributed to heavy weather. When weather is considered a contributing factor in an auto accident, there is still the matter of determining liability. If it is raining, hailing or even snowing (which happens on very rare occasions in Southern California), drivers should adjust their speed accordingly and should take care when turning and braking to avoid skidding out of control. As such, liability may still lie with another driver if you were injured in a car accident during heavy weather. An investigation into the collision may reveal that the driver was driving too fast for current conditions or a similar act of negligence. Though you cannot control the behavior of other drivers, you can take certain steps yourself to drive safely even when it is raining – the most common source of weather-related accidents in the Los Angeles area. First and foremost, slow down. It is important to drive more slowly than normal while it’s raining and after it rains, as the roads may be slippery. It will take longer to slow down and stop, and turning can be dangerous if you are driving too fast. Try to stay in the center lanes, as water tends to pool in the outside lanes. Increase your following distance – it will take longer for you to respond if the vehicle in front of you slows or comes to a sudden stop. Take care when driving behind or passing large vehicles, such as buses and trucks, which may spray water into the air and decrease visibility. Use your headlights to make it easier for other drivers to see your vehicle. Keep your windshield wipers in good condition, replacing them before the rainy season starts. Do not drive through moving water if you cannot see how deep it is – it could sweep your vehicle away. Be particularly vigilant in avoiding distractions and keeping your eyes on the road. You will need all of your attention to stay safe in the rain, especially if other drivers are not following the same safety tips. Try to stay off the road during particularly heavy rain or thunderstorms, when visibility and road conditions present the most treacherous conditions for drivers. Any motor vehicle accident can leave a victim with serious injuries or may even lead to death. Motor vehicle accidents are actually the leading cause of personal injury cases throughout the United States, most often arising from situations where a driver was distracted or negligent and caused an accident with another vehicle or with a fixed object. Are you interested in getting more information about motor vehicle accidents and what legal options you may have in the wake of an accident of this kind? A personal injury attorney at our Los Angeles law firm can offer you a free case evaluation to discuss the matter. The end result of a traffic accident involving a car and a bicycle is usually catastrophic – even if the impact occurred at a relatively low speed. A bicycle rider will have little protection against a 3,000-pound car. Even with a helmet and other protective gear, the bicyclist is likely to experience serious injuries that will require emergency medical care. There were 2,076 injury bicycle-involved accidents in the city of Los Angeles in 2010; 11 people lost their lives in these collisions. Though a relatively rare occurrence in the realm of motor vehicle accidents, a collision involving a bus and a car can result in numerous injuries. The size and weight of the bus will mean that the car will be more likely to sustain the brunt of damage, and the occupants of the car will be more likely to be injured. The bus driver and any passengers on the bus may also be at risk of injury; with the passengers at an increased risk depending on whether they were wearing safety belts or were sitting or standing. There were 100 fatal pedestrian accidents in Los Angeles in 2010 and 2,512 pedestrian-involved accidents that resulted in injuries. A collision involving a car and a pedestrian has the potential to cause catastrophic injuries – most often to the pedestrian. This issue is of the utmost importance, with a two-year increase in the number of pedestrian fatalities across the U.S. gaining the attention of the Department of Transportation (DOT) and giving birth to the campaign “Everyone Is a Pedestrian” to combat accidents. A fully-loaded commercial truck may weigh 80,000 pounds or even more with a special permit. When a car weighing only a fraction of that is involved in a collision with a big rig or semi-truck, the results can be deadly. Occupants of a car are far more likely to be injured in an accident than truck drivers. According to National Highway Traffic Administration (NHTSA) statistics from 2011, truck drivers accounted for less than 7% of truck accident fatalities. Occupants of other vehicles accounted for 80%, and non-occupants (bicyclists, pedestrians, etc.) accounted for about 13%. You can also find helpful information on some of the causes of car accidents and the types of collisions any type of motor vehicle may experience: head-on, rear-end, pile-up or side impact. Providing accurate, informative insight regarding auto accidents in the Los Angeles area is our primary goal, as this can help motorists, pedestrians, motorcyclists and bicyclists make the right choices while on the road – protecting their own well-being as well as the safety of others. Did you know that driver negligence is a leading cause of traffic fatalities in the United States? According to the National Highway Traffic Safety Administration (NHSTA), speeding is a contributing factor in about 30% of fatal traffic accidents each year. About 30% of traffic accident fatalities involve a driver who was driving under the influence of alcohol, with a blood alcohol concentration of .08% or greater (above the legal limit to operate a motor vehicle). 10% of injury crashes in 2011 were reported as involving a distracted driver. With these numbers, it is easy to see what a tremendous impact driving behavior has on collisions. The possibilities are endless, and all are potentially deadly. It takes only the smallest act of negligence to cause a serious accident that leaves one or more victims injured – or worse. In 2010, there were more than 50,000 injury auto accidents in Los Angeles County alone. 4,359 of these were deemed “alcohol involved,” and if you consider the national averages for speeding and distraction-related accidents as well, it is easy to see how most of these likely involved some form of driver negligence or wrongdoing. Fortunately, California law provides relief for car accident victims with an at-fault policy when it comes to traffic accidents. Drivers who cause traffic accidents can be held legally responsible for economic and non-economic damages, which may include medical expenses, future medical care, lost earnings, loss of future earnings, emotional trauma, pain and suffering. A Los Angeles car accident lawyer at Pacific Attorney Group can help you seek these damages so you can begin focus on moving on with your life. Talking to a passenger or talking on the phone may be dangerous while a person is behind the wheel of a moving vehicle. A distracted driver of this kind may easily cause a catastrophic auto accident that results in serious injury or even the wrongful death of one or more people. In fact, a study by the University of Utah revealed that talking on a cell phone while driving may delay a driver’s reaction time as much as having a blood alcohol level of .08% (the legal limit that constitutes drunk driving in California). This study applied to both drivers using hands free or handheld devices. 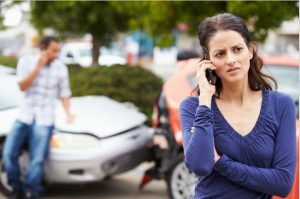 If you were involved in an auto accident in Los Angeles and the other driver was talking on the phone or otherwise distracted at the time of the accident, you may have grounds for a personal injury claim. A car accident lawyer at our law firm can meet with you to talk about the accident and what injury you have suffered, as well as what can be done to hold the distracted driver responsible for his or her actions. Although specific results will vary depending on the case, you may be able to seek a significant amount of financial compensation for your injuries, damage to your vehicle, and emotional trauma. All of this can help you rebuild and move on with your life. A driver who is talking on his or her cell phone may be distracted and may therefore commit any of a number of traffic violations or other actions that put others on the road at risk. Delayed reaction time may cause a rear-end collision, or a driver on the phone may simply not notice a pedestrian or bicyclist until it is too late. No matter the circumstances of your accident, working with a personal injury attorney will give you the best opportunity of reaching a positive case resolution that results in you receiving the money you need for medical care, lost wages, and possibly much more. Were you involved in an auto accident where the other driver was texting while driving? If so, you may have grounds for a lawsuit against the distracted driver under California personal injury law. Pacific Attorney Group can meet with you to talk about your particular case and your legal options during a free initial consultation. Our firm takes on all types of motor vehicle accident claims and lawsuits throughout the greater Los Angeles area, and we will be happy to see how we can help you. Texting while driving is just as serious as driving while talking on the phone. In some ways, driving while texting may be more dangerous as the driver must continuously look at his or her phone while reading or writing a text message. In these situations, the driver will not be paying full attention to the road, traffic signals and other vehicles around him or her. Texting while driving may result in a driver having a significantly delayed reaction time, similar to what occurs to a driver who is operating a motor vehicle while intoxicated. California law has recognized the dangers of texting while driving by implementing laws to prohibit such conduct. As a matter of fact, a driver may receive a ticket for driving while texting. The Wireless Communications Device Law went into effect on January 1, 2009, making it an infraction to read, write or send any text-based communication while driving. It is also an infraction to drive while talking on the phone, unless the driver is 18 or over and is using a hands free device. Law enforcement officers are authorized to pull over any drivers they observe violating these laws, at any time. Driving while distracted can put countless people in danger of serious injury or even death, in the event of an auto accident. Unfortunately, many drivers throughout Los Angeles are guilty of this. Distracted driving may include all types of actions that take a driver’s attention from the road. Talking to a passenger, talking on the phone, adjusting the radio, texting while driving, eating, putting on makeup, drinking and smoking are all ways a driver can get distracted. The same applies to driving when tired, angry or ill. These situations can delay reaction time or mean that a driver will not act cautiously and reasonably. When a driver takes his or her eyes and attention off the road for even a second, the results may be catastrophic. Talking with an accident lawyer is an important step to take if you were involved in an auto accident. Your vehicle may have been struck by a distracted driver, or perhaps you are being accused of causing the accident. Regardless of the particular situation, one of our experienced lawyers can talk to you about your particular case and your legal options. If we take on your case, we can work to bring a lawsuit against the driver who caused the accident. A rollover accident occurs when a vehicle actually tips and rolls over as a result of a collision or tire blowout. Rollover accidents are often more common in vehicles with a high center of gravity, such as SUVs or trucks. In any event, rollovers are particularly serious and can result in catastrophic injuries in the event of a roof crush or if the passenger is ejected from the vehicle. A pile-up generally occurs on high-traffic roadways at high speeds, resulting in multiple vehicles colliding. This collision can result in anything from minor car damage, to death. With the possibility of multiple vehicles being involved, car accidents suddenly become harder to handle when it comes to insurance claims. Pile-ups create a confusing cluster of information and possible injury that is ultimately difficult to understand and act upon. Were you involved in a pile-up in the Los Angeles area? If so, you may need a Car Accident Attorney in Los Angeles CA to help you with your insurance claim, which if done correctly results in the compensation you deserve. At Pacific Attorney Group we understand how difficult it is to initialize an insurance claim. That is why we offer a free initial consultation to help you get your claim started. Low visibility can normally be connected to the cause of a pile-up, solely due to the fact that a driver does not have time to react to an accident up ahead. Therefore, an auto accident originally involving two vehicles can escalate into a Pile-Up before anyone can take control. Rain is also another key factor in pile-up accidents, as drivers do not recognize the slick conditions of the road. Once a driver engages the brake heavily, the car has the potential to slide uncontrollably into traffic surrounding it. Determining fault in a pile-up can be difficult, but proper investigation is necessary so that all parties can receive the compensation they deserve. Our car accident attorney in los angeles ca pledge to conduct a complete investigation, and provide a lawyer that can work to determine how to help you pursue your insurance claim or lawsuit. Having full confidence in an attorney is important, and we will strive to deliver the compensation that you are entitled to. Involved in an accident? Talk to a lawyer at our Los Angeles law offices. If you have been involved in any type of car accident, a legal professional at Pacific Attorney Group may be able to help you. Our firm represents victims of motor vehicle accidents across the greater Los Angeles area and can offer insight regarding your right to compensation, how to deal with the insurance company, what to do next and so much more. Contact a Los Angeles car accident lawyer today.